Institute of Biological Sciences, Cledwyn Building, Aberystwyth University, Ceredigion, SY23 3DD. My most recent postdoc was addressing the complex phosphate acquisition system of Myxococcus xanthus. In a broader context, my research is attempting to understand the signalling pathways of M. xanthus particularly two-component systems and the sophisticated behavioural responses they regulate. My scientific career started when I was taught about molecular biology in A-level biology - especially the molecular basis of transcription, translation and the lac operon. Thankyou particularly to Dave Knott at King Edward VI, Norwich school for his inspirational and enthusiastic lessons. 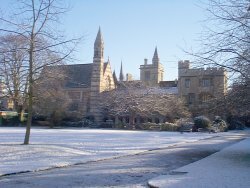 I was then lucky enough to do a BA in Biochemistry at Balliol College, Oxford. After whetting my appetite for molecular microbiology with a fourth year project in the lab of Keith Dyke, studying lactamase induction in the superbug Staphylococcus aureus, I took a PhD and a first postdoctoral position in the lab of David Hodgson at the University of Warwick, investigating light-induced production of carotenoids in Myxococcus xanthus. Subsequently, I have developed an interest in other signalling pathways of M. xanthus.